The question is this: is the new PS3 as easy to use as the PS2 before it? Let's be honest... the PlayStation 3 is a boy's toy, a bloke thing. It's primarily a games machine and the majority of the launch titles involve shooting, driving and sport. But one of the big strengths of Sony's previous console, the venerable PS2, was its ability to transcend its 'geeky' boundaries. The PS2 wasn't all about driving and shooting. It was also about jumping, dancing and sometimes it was about guitar playing. Its longevity in the market has given it an unparalled software base and its continuing popularity reflects this diversity of content. Put it this way: your mum probably owns a PS2. She probably still plays EyeToy on it. With this diversity in mind, we wanted to perform a simple test: can your wife or girlfriend get to grips with the next-gen features of the PS3? And can they do it against the clock? Dan Griffiths, Editor of PlayStation Technology Projects here at Future decided to give it a try. We pass our test subject the PS3 and the HDMI lead. Short work is made of the packaging (she's opened things before) and everything is systematically destroyed. "Which way up does it go?" She asks. You choose. 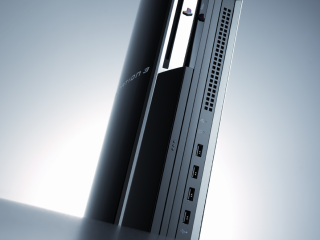 The PS3 goes upright. Things progress rapidly. The power cord goes into the wall socket the other end goes in the back of the PS3. That's the easy bit. I remove the supplied composite AV cord to avoid a spiral of confusion and tell her we'll use an HDMI lead instead. Damn. That's a tip off. She plugs the USB charging lead into the Sixaxis pad and looks around the back of the PS3 for a socket. She can't find one and she's getting tetchy. Already. She spins the PS3 around and inadvertently lifts the front flap revealing the Memory Card slots. Oh God. Things got a whole lot more complicated. She then tries (in an extremely half-hearted way) to ease the USB socket into each of the three card slots before spotting the four USB ports below and shoving it home with a flourish. "Stop the watch!" she cries. What about the TV? "GAH!!!" The TV is a Sony Bravia V2500. "Where do I plug it in?" She asks. For some reason she's panting. I'm stony faced. "Does it turn around?" Does it turn around!?! She spins the TV on it's base and once again Sony have let us down by clearly printing 'HDMI' on the sockets on the TV. It's a bit fiddly - "It only goes in one way!" - but it's in. Stop the clock: 4 minutes 20seconds. The TV is on. And Sky is on. She's done that before. She switches on the PS3 socket and the power switch on the PS3. The PS3's power light glows red! Which means that the PS3 is switched off. This is much harder than I thought. We're at a total dead end. "MAKE IT COME ON THE TELLY!" she shouts. I pass her the TV remote. She presses 1... Then presses 2... Then gives up entirely. Is that it? "Yes." You can't do it? "There's no point in this, it's impossible." Impossible? The time? 10 minutes plus. Which contains photos of kittens - as an incentive. It's a Canon IXUS 2. I've even given her the Canon USB lead and the camera end even has 'Canon' written on it.